The LPC4357-DB1, LPC4350-DB1 and LPC1850-DB1 development boards provide the easiest and lowest cost method to evaluate the new generation of NXP microcontrollers. All of the demo boards are pin-to-pin compatible, contain the same on-board peripherals and can be used either for breadboard prototyping or for evaluation of the recent NXP microcontrollers. You can easily expand the on-board peripherals with a wide range of extension boards. We have 3 types of demoboards currently available. Each one has its own microcontroller. The differences among them are detailed below. 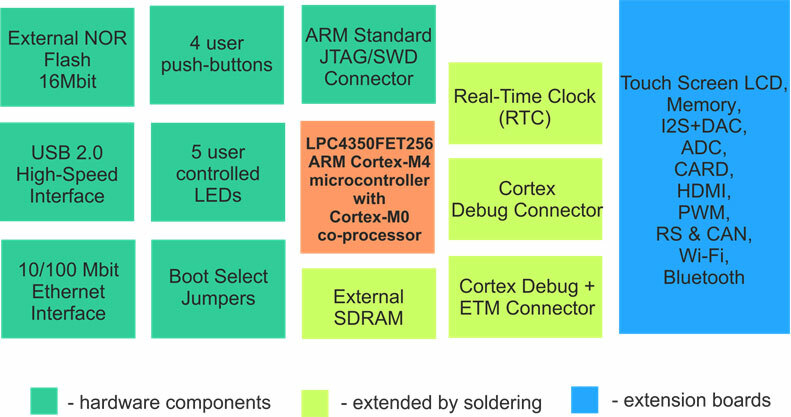 Both LPC4357-DB1 and LPC4350-DB1 development boards contain the dual-core ARM Cortex-M4/Cortex-M0 microcontroller. These microcontrollers are ideally suitable for the development of high-performance applications with advanced DSP functionality. The LPC4357-FET256 microcontroller has an internal 1 MB dual-bank flash and 136 kB of internal SRAM. With dual-bank flash you can run Cortex-M4 and Cortex-M0 cores simultaneously without any delay. The LPC4350-FET256 is a flashless version of LPC43xx series microcontrollers. It does not have internal flash but it has a larger amount of internal SRAM (264 kB). The LPC1850-FET256 is almost identical to the LPC4350-FET256 but with a single Cortex-M3 core and a little bit less memory. It gives you a nice platform if you don't need the performance of Cortex-M4. All these microcontrollers and all three development boards are pin-to-pin compatible. You can start with the LPC1850-DB1 and upgrade with a pin compatible LPC43xx later to enhance the performance of your application.